This web site is about the full-time RV adventure of Art and Mary which began the summer of 2011. We invite you to share in our journey. In May 2013 our “dream” took a bit of a detour. See the blog post dated June 20 for more details. We will update the blog as much as we are able. The inspiration for the web site name came from a local icon in our small Indiana community. 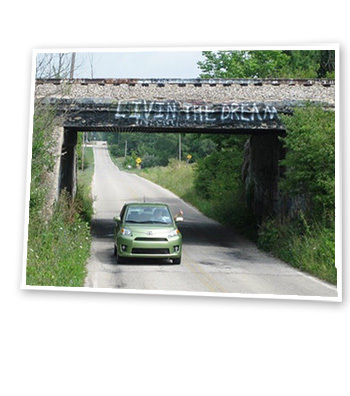 Our town is the home of Taylor University and the students take great enjoyment painting graffiti on an abandoned railroad bridge nearby. As we considered our adventure and a companion web site…we drove under this bridge one day, looked at each other, smiled and said we will be “Livin’ the Dream”…and so it began.